The victims of the Christchurch earthquake will be remembered when New Zealand play Australia in the Cricket World Cup in Nagpur on Friday. At least 65 people were killed when a 6.3-magnitude earthquake hit New Zealand's second city on Tuesday. However, the International Cricket Council (ICC) is confident the Black Caps will not miss any matches. "We don't think it's going to have any impact on the World Cup as of now," said an ICC spokesman. Pace bowler Hamish Bennett, Brendon McCullum, coach John Wright and three of the squad's support staff have links to the Christchurch area. New Zealand team manager Dave Currie told BBC Radio 5 live that all relatives and friends of the six were unharmed but said "it has been a pretty horrendous day". "We feel pretty helpless being so far away," he said. "All we can do is bring some small relief at a horrendously difficult time." 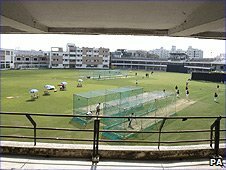 After hearing of the tragedy, the Black Caps trained for the upcoming game against their arch rivals. The match will be marked with the New Zealand flag at half-mast, a minute's silence while the players will wear black armbands. The New Zealanders are also recording a video message of sympathy and support for those affected in their homeland. ICC chief executive Haroon Lorgat added: "At times like this, sport can only offer its support and its deepest sympathy to those who have lost loved ones during such a tragedy. "We have already contacted the New Zealand Cricket [NZC] chief executive Dr Justin Vaughan to express our concern for him, his staff and the people of Christchurch. "The news we have is that the NZC offices have been severely damaged but thankfully everyone who works for NZC seems to have escaped without injury. New Zealand beat Kenya by 10 wickets in their opening match on Sunday. Meanwhile, there have been no reports of damage to Christchurch's Lancaster Park Stadium, which is due to stage seven Rugby World Cup matches this year. England are due to visit Christchurch for two matches, against Argentina on 10 September and against Georgia eight days later. Scotland are also scheduled to have a match in the city, against Argentina on 25 September. In a statement, the International Rugby Board said: "The thoughts and deepest sympathies of the global rugby family are with the people of Christchurch, their families and all New Zealanders at this very difficult time. "We feel it would be inappropriate to comment at this stage on the status of Rugby World Cup 2011 infrastructure or operations. The focus at this point must be on the emergency response."